An August 2008 post on Wright’s blog, months before the November 2008 introduction of the bitcoin whitepaper on a cryptography mailing list. It mentions his intention to release a “cryptocurrency paper,” and references “triple entry accounting,” the title of a 2005 paper by financial cryptographer Ian Grigg that outlines several bitcoin-like ideas. 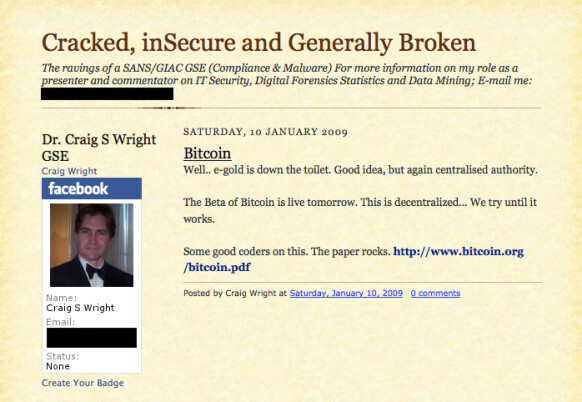 An archived copy of a now-deleted blog post from Wright dated January 10, 2009, which reads: “The Beta of Bitcoin is live tomorrow. This is decentralized… We try until it works.” (The post was dated January 10, 2009, a day afterBitcoin’s official launch on January 9th of that year. But if Wright, living in Eastern Australia, posted it after midnight his time on the night of the 9th, that would have still been before bitcoin’s launch at 3pm EST on the 9th.) That post was later replaced with the rather cryptic text “Bitcoin – AKA bloody nosey you be…It does always surprise me how at times the best place to hide [is] right in the open.” Sometime after October of this year, it was deleted entirely. Wright’s blog, his public records, and his verified writings on mail lists and Twitter sketch a man who matches with Satoshi Nakamoto’s known characteristics well enough to place him leagues above other candidates. If Wright is bitcoin’s creator, the revelation of his work carries more importance than merely sating the curiosity of a few million geeks.